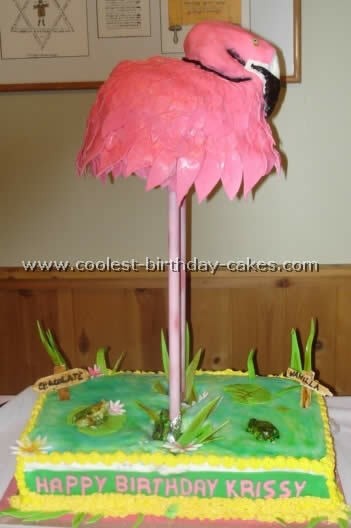 I made this cake for a friend’s wife who is obsessed with flamingos. I made the base cake half vanilla and half chocolate and the bird is vanilla. I used fondant to cover all and for the water used colored piping gel. The legs are copper pipes held to wood with flanges. This cake weighed about 60 lbs! I made the frog turtle lily pad and flowers and swamp grass out of sugar paste and fondant. The happy birthday on the front is also fondant cut out with the letter cutters. The feathers on the bird are all cut out with the fondant Leaf Cutter set and put on the bird body which was covered with a layer of pink fondant first. 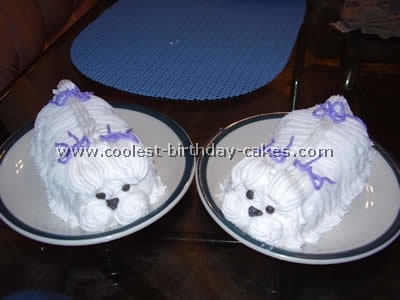 To make animal birthday cakes is a lot of work so I suggest you put aside a lot of time. This cake took me a good few hours to make.